The best crowdfunding preparation available. If you are considering running a crowdfunding campaign then Crowdfunding To Win is the best preparation available. Delivered through an online course with video and downloadable resources it provides the insight, structure, understanding and tips to make your campaign a success. Only around 30% of crowdfunding campaigns succeed, meaning 70% fail. We know that coaching can reverse that and drive success rates up to 70%. This course will be your coach and guide you through the otherwise confusing and demanding process of building and executing a successful crowdfunding project. By introducing you to the unique four stage TAMP process it will make the process understandable, manageable and successful no matter what your campaign is for, what type of crowdfunding you are considering, or wherever you are. 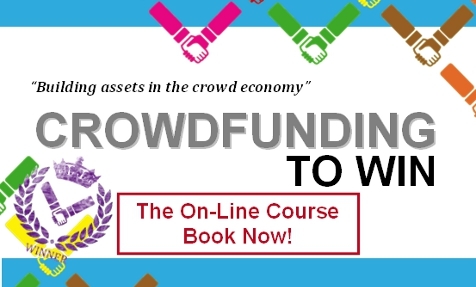 Licensed and used by many organisation and business support groups and endorsed by many of its hundreds of happy users the course has helped people all over the world to prepare and run successful crowdfunding campaigns. Exceptional value, once registered you enjoy lifetime access to the resources as they continue to develop and grow reflecting this rapidly emerging sector.